By Bobinette, March 21 in Questions About Trout & Salmon Trolling? Do I look for bait fish or "arches" on the screen while locating fish on Lake O? Meaning what makes you guys start trolling where you do end up starting? Or is it just experience and you go by water temp, time of year...etc? (don't own a Fish Hawk or similar...yet) I know it's sort of a big question and I am not looking for anyone's honey hole but I mean it more as a general starting point. Bait is great, but "hooks" don't lie. 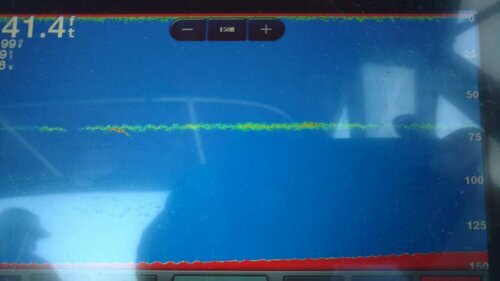 Your screen will look slightly different (on Lowrance) but here is basically what you would see if bait and fish were spotted while trolling and you have out one downrigger with spoon (top straight line) and a downrigger with an attractor (flasher on lower line). The bait is the dense (yellow/red when dense) "glob" that they are running through (another smaller off to the left near the 70.9) and the arcs are fish and possibly a couple fish on bottom as well. 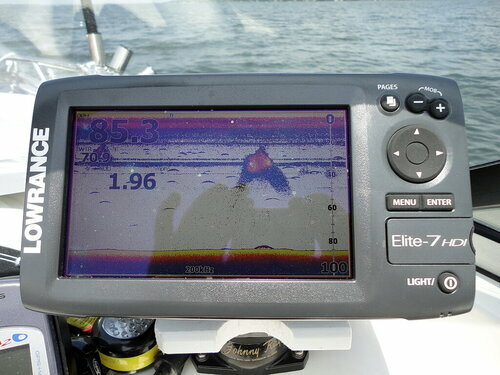 Sometimes the fish are mixed in with the bait so they may not appear as arcs or not be distinguished from the bait. 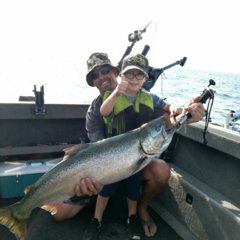 As you go through very dense bait pods you may see your rod tips bouncing as the lure or line hits the baitfish or you may even snag them. Looks awesome Les!!! Thank you very much for posting the picture, really makes it clear! On this pic it looks like there's all kinds of salmon, I guess, chasing the bait. I mean this is "hook" city!!! I will drive the boat down to Niagara river this Sunday for a test run, maybe chase some rainbows. Fish in thermocline. Set up on that. Sk8man , What sensitivity settings do you have your unit on to show the downrigger weights that well ? I’ve got the same unit and can’t seem to find that sweet spot. Water color, temp, temp breaks. In the spring if you find those you will find bait and fish. Here's some screen shots for you! is that all bait in the 4 pics that are in 100+ FOW? yes the big blobs are bait. You can also see my three downriggers dragging through. Look for bait. If it's dense chances are there are predators around. If you see both on your screen, Merry Christmas, put your lines in. Bait is easier to see moving faster than individual fish. You must always fish like the fish are there . Even if you have a blank screen or see very little . Many times especially late summer I have had great days and saw little or nothing . Except for the occasional little slash , which represents a fish moving fast through your transducer cone . Less than 30 ft , I rarely look at my screen except for depth and structure.